Jim Ketch is at home behind his trumpet. As a band leader, jazz soloist, sideman or conductor, Jim has the gift of making every musical opportunity exciting, fun and memorable. The inspiration for "Dancin' On The Rooster" from Jim's CD, Next Set on Summit Records. A special thanks goes out to Lily, Jim's granddaughter and dancing partner. A Distant View, Jim Ketch, trumpet and flugelhorn. Sometimes it just hits you. There’s a certain sound -- hard to describe, easy to hear -- that combines tradition, on-the-money musicianship, sensible and swinging writing, and that elusive quality, experience. Ketch, Director of Jazz Studies at the University of North Carolina, puts all the above pieces together in a recording that is both fresh and stimulating, but still right down the center of the road. I loved his choice of tunes, so let’s look more closely at “just the right” standards.” “Long Ago and Far Away” is a favorite of countless players, and Ketch and company give it an upbeat reading. “My One and Only Love” is another timeless tune, and Ketch credits another gifted trumpet hero, Bobby Shew, as his inspiration for this one. Tom Harrell’s “Sail Away” may not yet be considered a full-fledged standard, but it’s on its way. On this perfect melody for trumpet players, Ketch and friends are spot on perfect. Throughout this recording, there’s practiced balance and skillful communication between Ketch and his colleagues -- Dave Finucane, tenor sax, Stephen Anderson, piano, Jeffry Eckels, bass, and Ross Pederson, drums. The remainder of the CD is devoted to lesser-known or original compositions, all of which provide the varied and attractive straight ahead orientation of this beautifully realized recording. 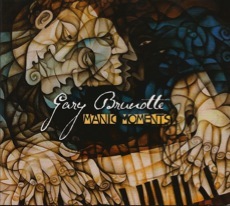 Summit Records, 2011, 74:22. A Distant View (Summit - 581) is a superb straight ahead album from trumpeter JIM KETCH, currently Professor of Music and Director of Jazz Studies at the University of North Carolina - Chapel Hill. He is joined on this recording by two fellow UNC faculty members, tenor saxophonist Dave Finucane and pianist Stephen Anderson, plus bassist Jeffrey Eckels and drummer Ross Pederson, and they make some impressive music together. 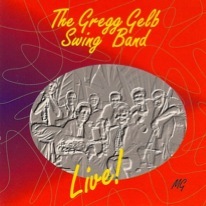 The program of twelve selections includes two standards, "Long Ago and Far Away" and "My One and Only Love," several jazz tunes by the likes of Russell Kerschner ("Grace"), Marcus Roberts ("You Won't Believe Me When I Tell You This"), Tom Harrell ("Sail Away"), Bobby Watson ("Beatitudes"), Dewey Redman ("Dewey's Tune") and Roy Hargrove ("Strasbourg/St. Denis"), and three originals by Ketch and plus one by Finucane. It is an eclectic program with roots in hard bop, but not limited to that genre. Ketch, Finucane and Anderson are interesting improvisers, and their imagination carries the program along in a way that keeps you alert. A Distant View deserves close up attention. 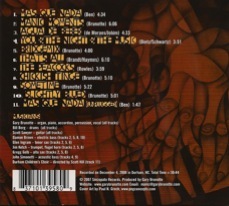 Jim’s debut CD appears on Summit Records and boasts a lineup of great North Carolina musicians. 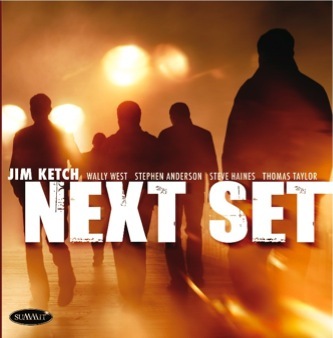 Jim Ketch - "Next Set"
Review: Lest we show lack of appreciation, let’s be mindful that much of the jazz in America is being conducted, so to speak, on college campuses. Often, many of the country’s more exhilarating jazz performances take place there—the result of mentors who could pursue full-time jazz careers if they wished, as well as the exuberance of youth for the music—unrecorded by the labels and unheard by the majority of jazz enthusiasts. Summit Records has given listeners the opportunity to appreciate what students and guest musicians have been hearing at the University of North Carolina at Chapel Hill: trumpeter and Professor Jim Ketch, who not only knows how to teach jazz, but also knows how to play it with precision and passion. Certainly, Ketch deserves major-label distribution. However, he chose to inspire students in North Carolina, unsung by the unaware masses. Nonetheless, Ketch is well known among full-time jazz musicians, such as Wynton Marsalis, Joe Magnarelli and Marcus Roberts, as the result of his participation in various festivals, stage productions and clubs. Moreover, on Next Set, Ketch shows a keen appreciation for the work of jazz trumpeters, as well as for the development of jazz, particularly from the bebop era to the present. 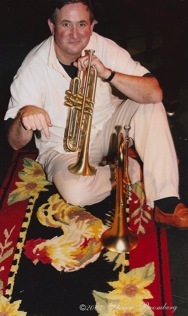 In addition, Ketch appears to enjoy the purity of the trumpet’s sound, whether in jazz or any other genre (for he does work with symphony orchestras and chamber groups as well as performing at the International Trumpet Guild). Among the compositions associated with jazz trumpeters, Ketch mixes in “Danny Boy,” which he introduces with the quiet dignity of a trumpet solo. Then, after the group’s improvisations over a re-harmonized arrangement, he soars to a penultimate crescendo—ending on an unexpected crystal-clear high note and bringing the requisite emotional weight to the performance before the final poignant fade. “Over the Rainbow,” which too can be overwrought in less professional versions, remains understated. Ketch improvises at a constant low volume, basically establishing his improvised second melody over the same changes with aplomb and, yes, finally beauty too. Still, despite these quieter interludes, Ketch’s focus on Next Set remains his own interpretations of trumpeters’ compositions, a few trumpet-led jazz standards and a few of his own compositions. In particular, Ketch appreciates the lyricism of Tom Harrell, for he includes two of Harrell’s more infrequently heard pieces on Next Set: “The Water’s Edge” and “April Mist.” Such interest is appropriate to Ketch’s own style, melodic, flowing and straightforward as he delves into a tune’s essence without gimmicky distractions. Indeed, Ketch, rather than interpreting Harrell, appears to pay tribute to him on “April Mist” with his own joyous, inspiring, smoothly connected choruses. In contrast, “The Water’s Edge,” though three-four, evolves into a minor-key emotionalism bordering on Coltrane/Tyner-like spirituality. Coltrane’s “Lonnie’s Lament” appears on Next Set too, slow and vibrating ominously with pianist Stephen Anderson’s tremolos before moving into a solid swing with Tyner-like deep bass notes anchoring broad chords. But Ketch includes homages to Blue Mitchell with “Blue Silver,” cleverly attached to Horace Silver’s introductory “Peace,” which serves as a showpiece for saxophonist Wally West’s solo. Kenny Dorham’s “Short Story” starts the album, Ketch soaring chorus by chorus into ever higher flights of improvisational intensity, evidence of Ketch’s influence by hard bop. Certainly, not only Ketch, but also the other four members of his group perform at a high level that deserves much wider attention from the jazz listening public. Fans of jazz trumpeting no doubt will appreciate the work that Jim Ketch is doing for North Carolina students, and the work that he does on Next Set. 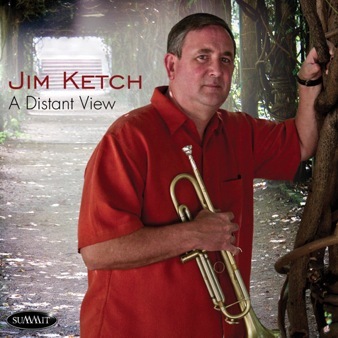 This is the debut recording of Jim Ketch, a veteran trumpeter and jazz educator. 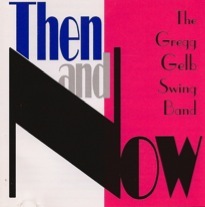 This well-paced studio session, which includes tenor saxophonist Wally West, pianist Stephen Anderson, bassist Steve Haines, and drummer Thomas Taylor, is a refreshing change from many initial efforts, as it mixes familiar standards and jazz gems with lesser-known works and originals. The snappy scoring of Kenny Dorham's Latin/hard bop vehicle "Short Story" is an excellent introduction to the quintet, while John Coltrane's "Lonnie's Lament" omits the tenor, focusing on the lyrical playing of Ketch and Anderson's dramatic solo. Tom Harrell's "The Water's Edge" dates from the 1970s, an infectious jazz waltz showcasing Haines, West, and the trumpeter. Ketch and Anderson interpret "Over the Rainbow" as a dreamy duet, bringing new life to this frequently recorded standard. The leader's happy "Dancin' on the Rooster" recalls the swinging charts played by Count Basie during the early '60s, with Taylor's brushwork providing the peppy undercurrent. Anderson's "Moments of the Sublime" is a post-bop vehicle full of twists and turns, suggesting busy Manhattan nightlife. This CD serves as a valuable introduction to the work of Jim Ketch. With "Next Set" (Summit), trumpeter Jim Ketch steps out of his familiar roles as director of jazz studies at UNC-Chapel Hill and leader of the N.C. Jazz Repertory Orchestra and focuses on small group playing. The result is a bright, confidant session rooted in hard bop with fellow academicians Wally West (tenor saxophone), Stephen Anderson (piano), Steve Haines (bass) and Thomas Taylor (drums). Kenny Dorham's "Short Story," the opener, establishes the orientation of the soloists, with clean, lyrical, boppish runs and strong, clear high notes from Ketch; soulful, burly playing from West; and fluid rhythmic jousting from Anderson. Ketch's "Changes You Can Believe In," an Art Blakey-like minor blues, and a medley of Horace Silver's "Peace" and Blue Mitchell's "Blue Silver" continue this first impression. "April Mist" and "The Water's Edge," both by Tom Harrell, offer the group more modern harmonies, and Anderson's "Moments of the Sublime" stretches the soloists even farther, almost into avant-garde territory. 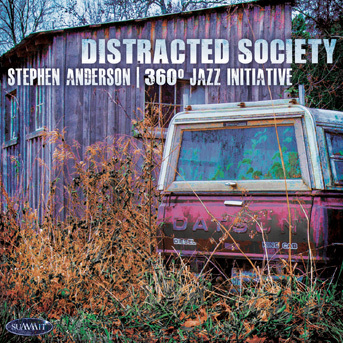 Anderson's driving, percussive playing is definitely a catalyst here and elsewhere. Ketch's "Dancin' on the Rooster" goes back to an earlier era with an easygoing groove and soft-shoe drum breaks. This is a mature group, sure of its ability and blessed with good taste and a demonstrable knowledge of jazz history. These teachers swing. I’ve learned from nearly two decades of writing reviews that it’s never a wise idea to dismiss a recording simply due to the unfamiliar names of the players. There are skilled, swinging, dedicated jazz musicians everywhere. 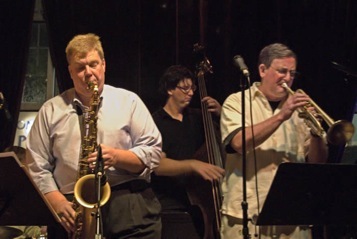 So why not in Chapel Hill, North Carolina, where Jim Ketch serves as Director of Jazz Studies at the University of North Carolina? In addition to numerous other musical activities throughout the world, Ketch has put together a bristling, high voltage quintet in the best of the hard bop tradition. Wally West, tenor; Stephen Anderson, piano; Steve Haines, bass; and Thomas Taylor, drums, are the remaining newbies to this listener. Among a few original compositions and a couple of stirring tunes by trumpet ace Tom Harrell, the quintet examines a few rarely performed gems like Kenny Dorham’s “Short Story”; John Coltrane’s “Lonnie’s Lament” and an album highlight medley of “Peace” and “Blue Silver.” To these, add a few standards. And the result? A perfect balance of song selection, varied tempo, skilled solo work, and as any bop group must, they cook! Thirty bucks a head at the door if these guys were working a club in New York. Undoubtedly somewhat less in Chapel Hill. And, familiar names or not, let’s hope the locals appreciate what they have in Ketch and his swinging quintet. 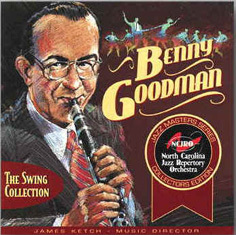 "The artistry of Benny Goodman and the music of the Benny Goodman Orchestra remain one of the most recognizable landmarks in American musical achievement. The NCJRO is so pleased to bring you these new performances of this spirited and timeless music." "Since its debut in 1993, the NCJRO, led by UNC music professor and trumpeter Jim Ketch, has consistently demonstrated exacting standards akin to Goodman's. It is a well rehearsed ensemble. I marvel at the rhythm section's ability to step into each assignment with a true feeling for the era and the subject. 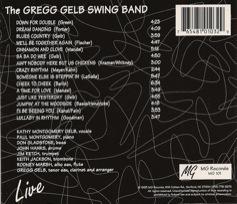 Kathy Gelb's vocals always radiate optimism and a solid sense of swing. And the horn players consistantly demonstrate musical integrity via section balance, ensemble blend, and swinging, unified phrasing." "The rich script which life presented to Edward Kennedy "Duke" Ellington is presented to us through his compositional genius and the artistry of the performers who interpret that genius. 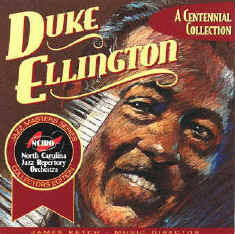 To be able to join my colleagues in recording this Ellington collection as we celebrated the centennial of his birth has been among the richest and most rewarding experiences of my life. I hope that each of you will experience some of the joy in listening to this collection that we experienced in preparing it for you. To Duke - "The world loves you madly, your music lives on!" "Space does not permit a play-by-play description of the performances on this CD. But dig the echoes of the Ellington soloists, the authentic Ellington band drive and feeling of the rhythm section, and the shifting horn colors. 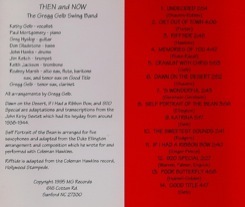 The tunes range from "Ring Dem Bells" and " Mood Indigo", both written in 1930, to "Mount Harissa" (from the "Far East Suite"), written in 1966. Each musician in this band rates high on my musical scale." I would like to share with you my great admiration for and appreciation of the fine musicians of the NCJRO. Throughout this recording you will listen to creative soloists, exciting section work, marvelous lead playing, and the kind of driving rhythm section needed to bring it all together. I am honored to serve as musical director of such an outstanding group of musicians. 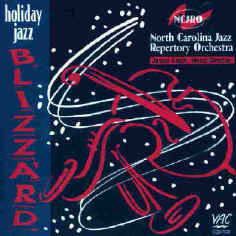 On behalf of all the members of the North Carolina Jazz Repertory Orchestra and our Board of Directors, I wish you many hours of listening enjoyment! Don't forget to dress warmly .... a blizzard's headed your way!